The 4Rs are listed in this order: Reduce, Reuse, Recycle, and Rebuy. From an energy and materials standpoint, reduce and reuse require the least, while recycling takes a bit more, which is why it is third on the list. By starting with reduce and ending with rebuy, we save the most resources, reduce greenhouse gas emissions, create jobs, and close the loop. We might even save some money along the way! Preventing waste means that we don’t create it in the first place. We can reduce waste by changing our purchasing practices, including the types of products and packaging that we buy. Reducing what is used can cut down on the volume or toxicity of the waste stream. Because we don’t create this material, we avoid all the environmental impacts and costs of producing a product in the first place. To reuse something means to use it over again. This can happen when an item is used for its original purpose or for a new one. Reuse is a great way to extend the life of goods that we already have, minimize the need for new items, and keep materials out of the landfill. At its basic form, to recycle means to change the original form of a waste material to create a new product. For instance, an old soda bottle may be collected and processed into new polar fleece; an empty aluminum can might be melted down and made into a new one; or used tires might be processed into a rubber floor mat. When it comes to recycling, you’ll notice that we don’t just talk only about curbside single stream recycling anymore. Recycling is much bigger than this. You can now bring many additional items at the Recycling and Solid Waste Center. 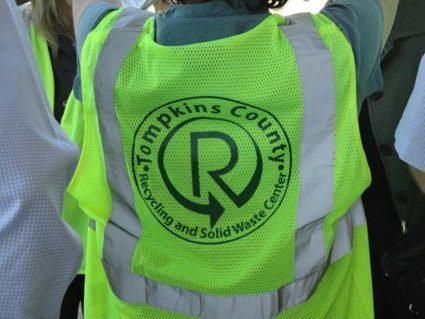 Food scraps recycling, a form of composting, is also expanding locally, with drop spots around the county. Compost fruit and vegetable peels in a backyard bin or at a drop spot. The fourth R is rebuy, which closes the loop and keeps the previous steps in motion. When we purchase items with recycled content, we increase demand for these items, which means there are companies who want our collected recyclables. Through these green purchasing efforts, we also look for items that are durable, multipurpose, non-toxic, reused, or recyclable.